At Momentum, we love our clients! 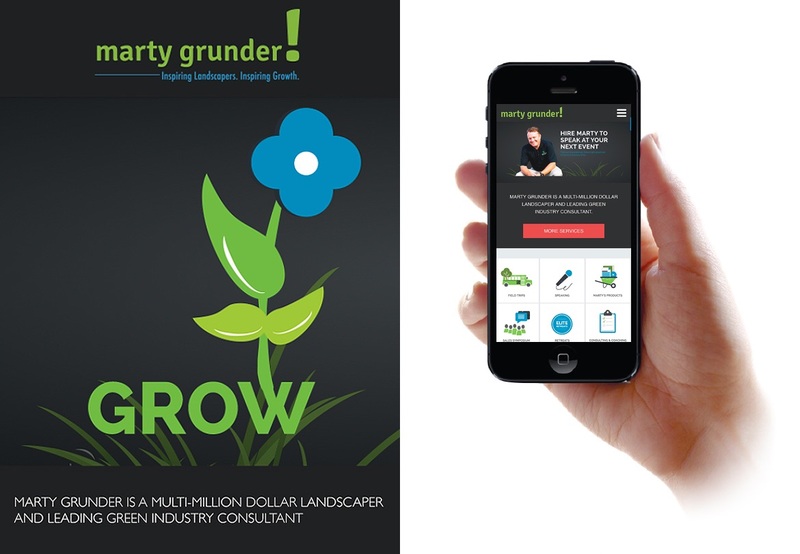 That couldn’t be truer than when we had the opportunity to work with Marty Grunder, Award Winning Landscaper and Entrepreneur, Green Industry Expert, and Consultant. As an agency, we strive to deliver projects that exceed expectations, inspire, and impress. But in working with Marty Grunder, our team found themselves being the ones receiving the inspiration. Marty’s enthusiasm and quest for achieving high standards was truly contagious. He not only raised the bar, he encouraged us to deliver a remarkable product. 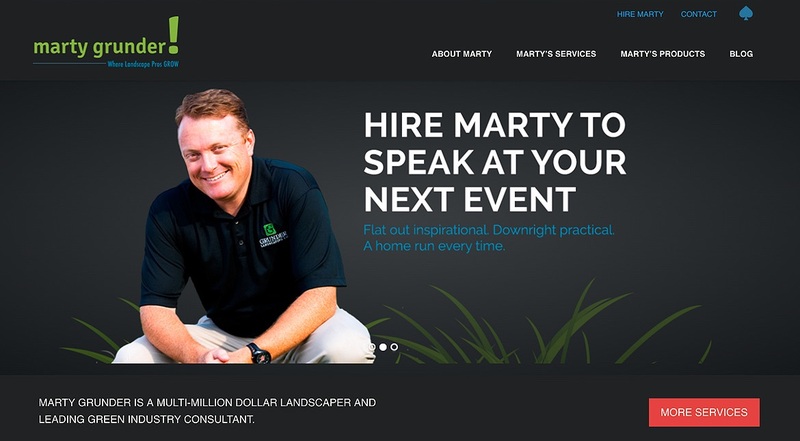 When Marty helps other landscapers, it’s not from the perspective of “been there, done that,” but from “still there, doing that.” As a professional agency, our entire team understands that every client has its own unique goals and objectives. We do not create cookie-cutter designs. That’s why before even securing this project, we met with Marty to get to know what his business was all about, where it was heading, and what was needed to help get him there. From day one, we recognized and respected each other’s areas of expertise and were expected to bring our “A” game. After developing our game plan for the entire project, the first order of business was to give Marty’s brand identity a facelift, which included a new logo, color theme, type treatment, and illustration style. A brand identity standards manual was created to ensure all of Marty’s marketing materials, advertising, and media usage at his events remained consistent. Next, we began designing concepts for the new site that we believed would best speak to the “green” industry, Marty’s core audience. We came up with a flat design approach, which used illustrative icons to help drive the navigation. We knew the design would easily connect with Marty’s audience and would reinforce Marty’s practical fresh approach to consulting. Knowing that networking and connecting with people were key factors to Marty’s success, we incorporated a blog section with several separate categories. A page of the site is also dedicated to providing information on hiring Marty for individual and group consulting. Finally, an ecommerce store was added to the site so people could order Marty’s products. 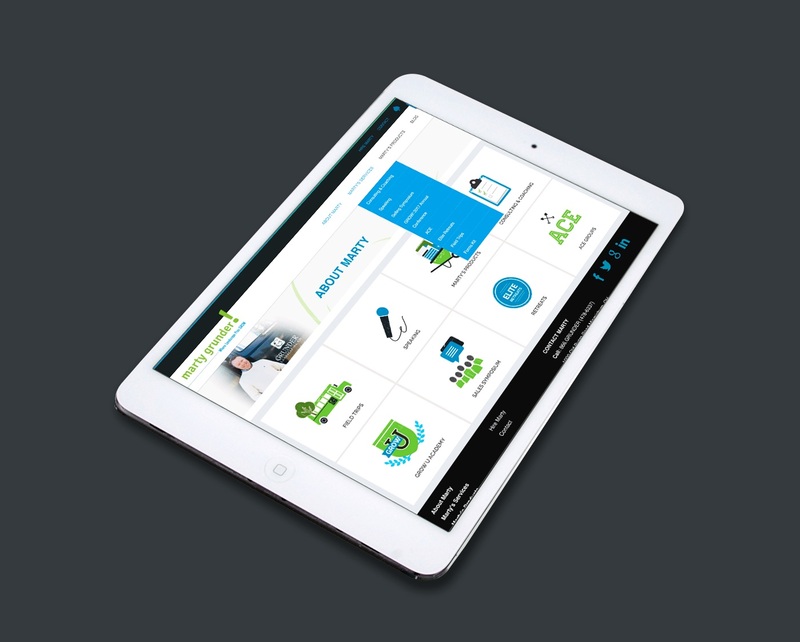 The responsive site, optimized for viewing on mobile, tablet, and desktop computers, was built in WordPress and uses WooCommerce for online shopping.